Roberto Prosseda, Piano (Steinway&Sons Grandpiano D274). 24 bit/96Khz Recording at Teatro Sperimentale, Ancona, Italy, on August 2003. 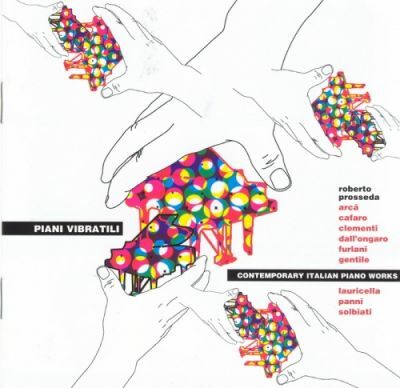 Several important elements in recent music for piano in Italy are highlighted by the compositions on this CD, which were written between 1970 and 2003. They have in common an approach which respects both the mechanical characteristics and the timbre of the instrument. In this way the piano, undoubtedly one of the most “historicised” of instruments, assumes a wide-ranging capacity for evocation, often bringing to the surface sonorities and harmonic models derived from earlier material. The pieces, arranged in chronological order by year of composition, require the pianist to take a particularly active role in performance, which makes them highly enjoyable to play. It is hoped that this enjoyment will be perceived and shared by the listener. B.A.C.H. (1970), by Aldo Clementi, ushered in the most recent phase of the composer’s compositional language, using diatonic musical fragments. In this case the thematic reference is to Bach’s Fantasia in C minor BWV 906, from which Clementi took the four opening chords and three ascending scales. In B.A.C.H., the three scales are arranged in three different registers of the keyboard, each being performed with a different dynamic. By staggering them in non-uniform layers, Clementi builds up a particular form of counterpoint, whose rapid, minute particles gel into an indistinct flow of sound or continuum, from which accented notes occasionally emerge, corresponding to the four notes of the cryptogram on the name Bach in the German notation (B flat - A - C - B). The piece is to be played as quickly as possible and repeated at least three times: in this performance, there are seven repeats in all. The result is peculiarly hypnotic, with the extreme rapidity and pulverised momentum creating an altered state of perception of time and of the sound itself. One aspect which Trying (1980), by Ada Gentile, shares with the other pieces is its tendency to explore the remote meanings of the sound message, delving into deep-lying strata in the listener’s memory. The piece runs symbolically through the development of keyboard music, from its origins to late romanticism. It is based on extremely broad, expanded sonorities, establishing an almost hypnotic, timeless mood. Since the dynamics are thinned out appreciably and the thematic material is severely limited, the ear is guided into the fascination of silence, led towards acute awareness of the space between the individual sounds. This space perhaps assumes even greater importance than the sounds themselves, forming a negative of the music, in the photographic sense. In a world in which the value and the very existence of silence is all too often ignored, Trying has its own special poetical and aesthetic value. In his two compositions recorded here, Marcello Panni alludes stylistically to early 20th century music from the Americas. In Tangomix (1984), as suggested by the title of the piece, 24 Argentinian tango fragments are overlaid and “remixed” using a brilliantly paced collage mechanism. In Desire – Ragtime two-step (1987) the same citational approach is applied to various fragments taken from Joplin’s rags, including the celebrated Maple Leaf Rag. “The compositional technique,” explains the author, “is a combination of assemblage or collage, automated procedures and involuntary citations. It would be superfluous to list all of the influences that are shamelessly featured”. The constant renewal of the subject matter, albeit within the same “centrifugal” movement, leads to an original and attractive mixture of sounds, with a high degree of irony and vitality. Threnos (1988) by Maurizio Furlani features an explicit stylistic and thematic reference. It is based on material derived from Nuages Gris, one of the last works of Franz Liszt and also one of his most visionary and enigmatic compositions. The dark and disquieting character of the model is intensified even further by Furlani, who heightens the dynamic contrasts by effective use of the damper pedal markings. The shape is thus reshaped over and over again like magma, each time taking on fresh colours and each time propounding, with a greater or lesser degree of similarity, the original harmonic connections. The result is disturbing, obsessive music, which finds its own expressive power precisely in the forced reiteration of the same cells, deliberately shorn of any further, more complex elaboration. Threnos is dedicated to the memory of Giampiero Francia. In his Autodafè (1989), Michele dall’Ongaro also exploits the evocative potential of the piano, in a manner equally effective and atmospheric. The piece is divided into five movements, each of which takes a different aspect of expression to extremes: suspense and suspension (number one); languor and dreams (number two: a lullaby on the white keys only); schizophrenia and hysteria (number three, rather like a jazz pianist gone mad); peals of bells (number four), clusters and untrammelled aggression (number five). The composer has compared performing Autodafè to divining or reading the tarot cards, thus underlining the special relationship which must be established between the pianist and the music. In this sense the score itself, although meticulously laid out, may nonetheless be thought of as a skeleton concept, to be fleshed out by the performer in as individual and creative an elaboration of the artistic message as possible. Nuances (1990) is made up of six aphoristic passages, each of which describes and explores the semantic aspects of a given colour, rather like six slides: in order, these are Blue and Lilac, Violet, Pink, White and Black, Yellow and Orange, Silver. Making refined use of the pedal and sympathetic vibrations, Massimo Lauricella creates particularly evocative timbres, stimulating both player and listener to a fascinating, in-depth exploration of synesthetic and inter-sensory relationships. Expanded sonorities are once again to the fore in this piece, in close rapport with the enclosing space. The many, highly variegated resonances tinge the soundscape in constantly changing ways, exalting the effect of the individual sounds, which themselves often give the impression of being moving splashes of colour. Nuances was awarded the Grand Prix de Composition at the first Rendez-vous du Piano en Creuse festival in France. The Ten Bagatelles (1993) by Paolo Arcà are short, aphoristic pieces, each dedicated to a pattern derived from the established compositional tradition. Here again we find the poetics of subtraction, chiselling out the essential aspects of expression and often preferring simple structures that are directly intelligible. As the composer puts it, “these are ten little pictures, essential in colour and creating an emotional journey in miniature. The musical images, which follow each other without a break, are characterised by a transparent, light style of writing”. Using fine sonorities, with dynamics so restricted as to verge often on silence, this music invites the listener to be attentive to the slightest variation in harmonics and timbre, investing with special charm details that in other contexts might pass unnoticed. In Swing Piece (1993), Sergio Cafaro plays with pre-existing musical models, drawing on various 20th century sources that range from the biting rhythms of Stravinsky (especially in the opening passages) to the highly individual, inimitable jazz of Bill Evans. The spirit of Bill Evans is particularly prominent in the central episode, although there is no straight quotation. Neither is there just improvisation in the manner of Bill Evans, however, given that the score is highly precise and detailed, allowing no freedom of interpretation whatsoever to the performer. Clearly the composer’s long experience of the piano and his innate ability to evoke in only a few moments the personalities of great composers of the past (Cafaro’s remarkable impromptu performances à la manière de are justly celebrated) are reflected in this composition, albeit in the predetermined formal pattern of a three-part structure. We remain within the citational ambit, but in a completely different stylistic context, with three works by Clementi composed in 1998 and 1999. These are characterised by a particular use of polytonality, which achieves in music an effect comparable to the optical illusions of M. C. Escher’s multiple perspective images. In Loure (1998), the citational material comes from the dance itself, whose ternary rhythm is however hidden behind a three-part counterpoint, which (poetically) blurs its outlines. The piece is made up of three very short movements, each of which reiterates, more slowly, the same cell, each time newly and differently layered. The Variazioni (1999) are developed in a quadruple (though never simultaneous) counterpoint in which the same hexachord (F - E - D - C - B flat - A) is continuously repeated, varying the pitch. The twelve variations consist of different overlapping of the parts, which are gradually staggered to the point where each disappears altogether, one by one, as if a worn-out mechanism were breaking apart. In Vom Himmel hoch (1999) Clementi draws on the Bach chorale, whose four parts are worked out with transpositions and overlapping augmentations in eight different movements (each echoed in a repeat), of which the last four are none other than the first four in retrograde, in the pattern 1, 2, 3, 4, 4, 3, 2, 1. Each of the Interludi (2000 – 2002) by Alessandro Solbiati is dedicated to a given “musical figure”, i.e. a particular element of rhythm, melody or timbre, whose multifarious expressive possibilities are then explored. The first Interludio is based on six chords that are like peals of bells, which are alternately repeated in diminuendo, creating an atmospheric spatial effect. The second, “Homage to Luis de Pablo”, features a particular melodic curve, flamenco in feel, used by the famous Spanish composer and adopted here in a sound context characterised by particular harmonic resonances. The third Interludio is built entirely on a two-part counterpoint with rapid, detached notes, out of which there develops a constant crescendo to the final fortissimo. The fourth Interludio is more complex in structure: slender, tense melodic lines rising into the upper register alternate with more rhythmic and measured passages, always with the fluid, natural cantabile that is so characteristic of Solbiati’s poetic manner. In Invenzione 4 (2003), Clementi uses the same contrapuntal procedures of the earlier works, reiterating a three-note cell which generates a four-part canon. The six-part structure is similar to that of Vom Himmel hoch: 1, 2, 3, 3, 2, 1, with a progressive accelerando (in parallel with the melodic uplift) up to the midpoint, followed by a corresponding ritardando from there to the end. The extremely rigorous structural scheme does not, however, preclude a latent, implicit lyrical component: the expressive individuality of each single part becomes estranged in the tightly-woven contrapuntal mesh, generating new and unexpected poetic results.